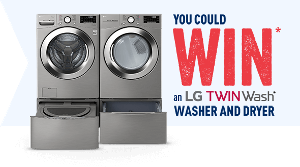 Prize: One (1) Grand Prize available to be won, consisting of one (1) LG TWINWASH® Washer and Dryer - ARV is $4,000.00 (CDN). Statistics: This contest was opened by 144 and entered by 3 ContestChest.com members. 2% of those who opened the contest, entered it.